Gilded Age Tours is an informative and exciting extension of “Speaking of Art.” Ed organizes every detail for unforgettable visits to museums and sites of architectural and historic interest. As with the radio show, ambience as well as information is of central importance. The pace is leisurely and comfortable, with all travel, entrance, and meal expenses provided. And with on-site experts, such as museum curators, to illuminate our visit, you are assured of a first-rate cultural experience. 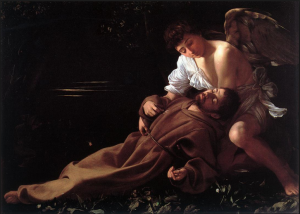 Ed will brought a group to the Detroit Institute of Arts to view Caravaggio’s great painting, St. Francis of Assisi in Ecstasy, now on exhibition. His guests won the bidding for the visit at the recent Golf & Tennis Outing fund raiser of Rotary Club of Ann Arbor. 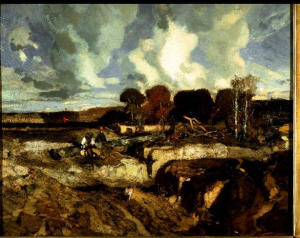 When visiting the University of Michigan Museum of Art, be sure to take in the French Romantic artists, Alexandre-Gabriel Decamps and Eugene Delacroix. 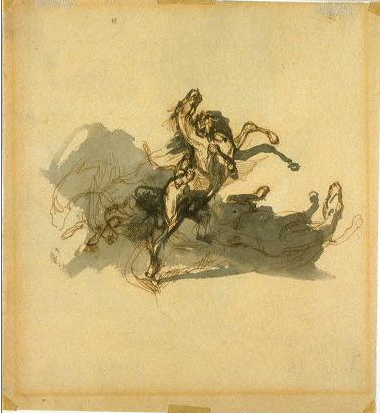 Pen, brown ink, and wash drawing, Horse Attacked by a Lion, by Delacroix, c. 1830. This is a fine example of what this artist does best — making us experience a climactic moment. Note the ferocity of two noble animals locked in a death struggle. The Decamps painting, Landscape in Picardy, is a bold evocation of a dry, ravine-scarred meadow running from a flat, almost abstract, foreground to a horizon dominated by a girdle of trees. Arched over everything is a rapidly painted cloudy sky. The light effects, coupled with the abrupt perspective, give a jarring sense of unreality, which is underscored by the somewhat obscured “couple” with a child playing nearby. Also, an arbitrary splash of red in the far distance brings our eye deep into the scene. 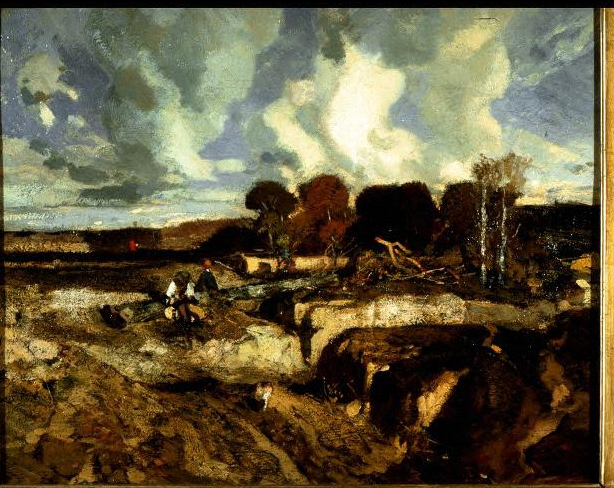 This landscape foreshadows those of Cezanne in the 1880s as well as those described by H.P. Lovecraft in his short stories.